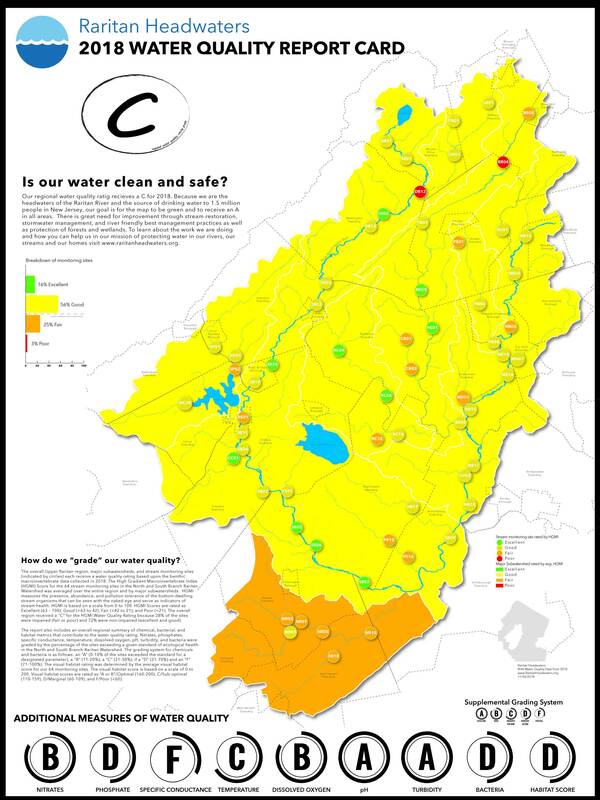 This year the watershed health is a C.
Our regional water quality ratig recieves a C for 2018. Because we are the headwaters of the Raritan River and the source of drinking water to 1.5 million people in New Jersey, our goal is for the map to be green and to receive an A in all areas. There is great need for improvement through stream restoration, stormwater management, and river friendly best management practices as well as protection of forests and wetlands. To learn about the work we are doing and how you can help us in our mission of protecting water in our rivers, our streams and our homes visit www.raritanheadwaters.org. Poorly-planned development and unwise policy decisions at the local and state level continue to threaten the region’s waterways along with the cumulative impacts of pollution coming from irresponsible management of hazardous materials, fertilizers, pesticides, failing septic systems and other common sources. Especially in the context of extreme weather events, there is a heightened sense of urgency to protect our streams. How healthy are the streams near you? We all have a “watershed address.” Enter your address in the map below to locate your subwatershed and see how the streams and rivers in your neighborhood scored this year in terms of water quality. Click on the colors to view the overall grade. For more details, click on the grey dots representing Raritan Headwaters permanent stream monitoring sites. You can help protect water quality. The data below is from 2017. 2018 data will be updated soon. Many people take clean water for granted, but we know it takes vigilance and hard work to protect the water in our rivers, streams and homes. And we can’t do it alone. We need your help to ensure that everyone within our reach has access to safe, clean water that is swimmable, fishable and, above all, drinkable.